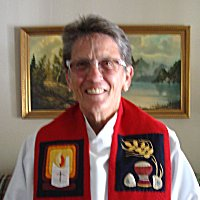 Marianne T. Smyth from Silver Spring, MD, has been affiliated with the Living Water Inclusive Catholic Community in that area. She is a mother of two sons and was a secular Carmelite for seven years. She has a Master’s Degree in Counseling and has worked with students with learning disabilities and those who were drug and/or alcohol dependent. She has earned four certificates from Global Ministries University in Theology and Scripture. As the primary caretaker for her elderly mother Marianne now ministers to those facing sickness, dying and death. Marianne was ordained priest on May 24, 2014 in Brecksville, Ohio.